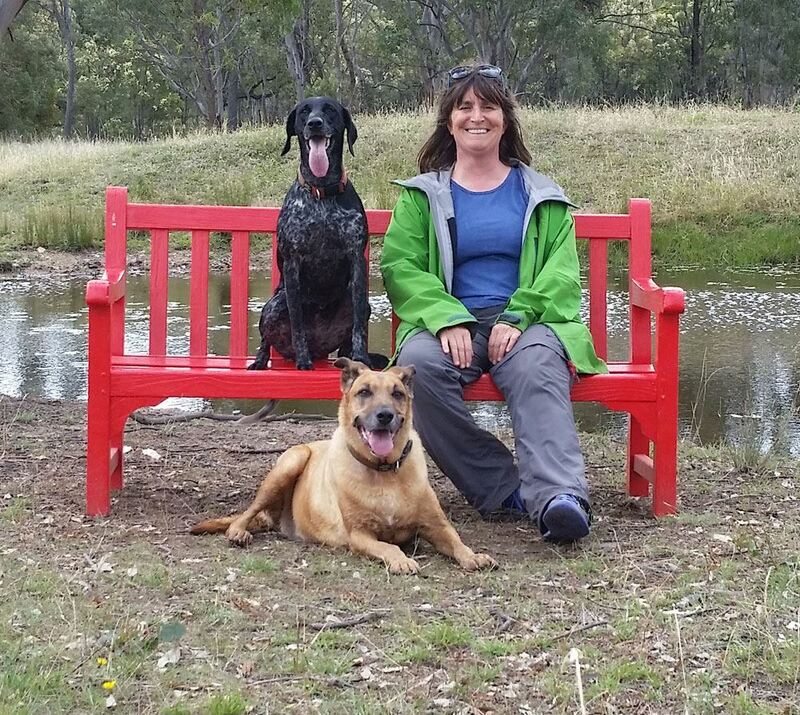 Our Professional Dog Trainer members each run a business within Australia. As with all our members each one signs an agreement to use methods that are Force-Free which means No Shock, No Pain, No Choke, No Fear, No Physical Force, therefore No Compulsion Based Methods are employed to train any of the dogs in their care. Here they share a little of themselves, their philosophy and some best practice hints along the way. Click on the member name to view their profile and contact details. For us at Goodog learning is a cooperative process based on a trusting relationship. 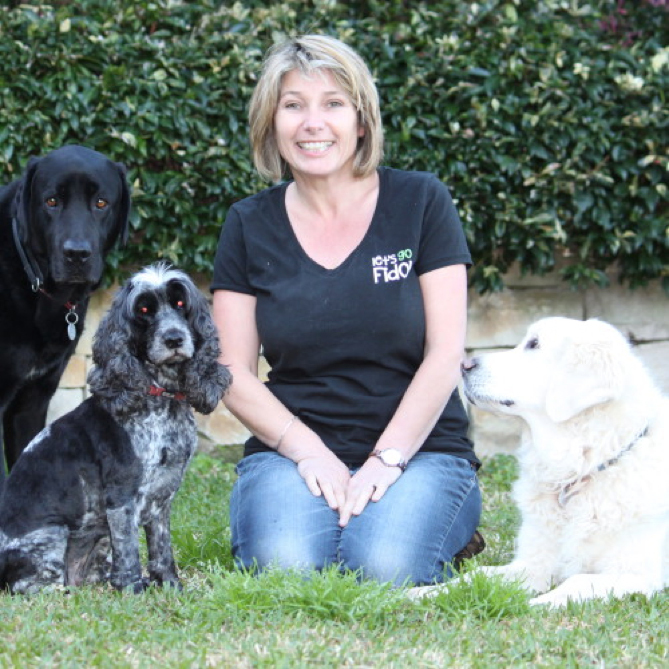 The business has been running very successfully since 2007 on the Northern Beaches Sydney, offering puppy pre school classes, courses for teenage and rescue dogs, workshops for recall, loose leash walking and trick training as well as casual fun Agility and Rally O classes. I also do in home consultation for problem behaviours and puppy or rescue set ups. I train and compete successfully with Shellbe (short for she’ll be right) my German Short-haired Pointer in Agility and Rally O. My senior Zorbas, a Kelpie Ridgeback cross, enjoys retirement at almost 13 years. I hold a Diploma of Canine Behavior Science and Technology from the Companion Animal Science Institute in Canada and a Certificate IV in Companion Animal Services with the Delta Society Australia. I did have a life before dogs and hold a Master’s Degree in Modern European History and Economics from the University of Berne (Switzerland) and a MBA (Master of Business Administration) from Southern Cross University Australia. In addition, I have in-depth experience in adult education and training. My training tip: You can train an old dog a new trick but if you miss early socialization between 8 and 16 weeks you will have a hard time catching up with your puppy. So do not miss this crucial time. From a very early age, my love of animals was nurtured by my Mother, who loved all animals. Our family has always been a safe haven for stray animals including dogs, cats, chickens, goldfish, birds,ducks rabbits, pet goats, sheep, cattle and horses. My love of dogs and helping pet dog owners understand behavioural problems and train their dogs, is extremely important to me. I manage my own business and have my own training centre, built on my home property at Nangkita, Via Mount Compass. The Good Manners Training Programs covers Foundation, Bronze, Silver, Advanced Silver, Gold, Masters, Agility, Tricks, Nose Games, Dog Dancing and Clicker Training and is based on building a relationship between dog and handler to enhance the human animal bond. Every dog, small, large, elderly, puppies, pure bred or mixed and especially rescue dogs, deserve to be looked after that includes a balanced diet, exercise suitable for that dog, regular vet checks, worming, vaccinations and an education using Force Free, Pain Free, Fear Free training methods. Most of all they deserve to be loved by their handlers and their family. Keep criteria clear. Short training sessions daily. Keep it Simple. Use lots of Patience, Praise, Pats and Playtime. Find a Trainer or Training School where the Trainer has been educated in how to Teach and Use Positive, Force Free, Pain Free, Fear Free Methods. 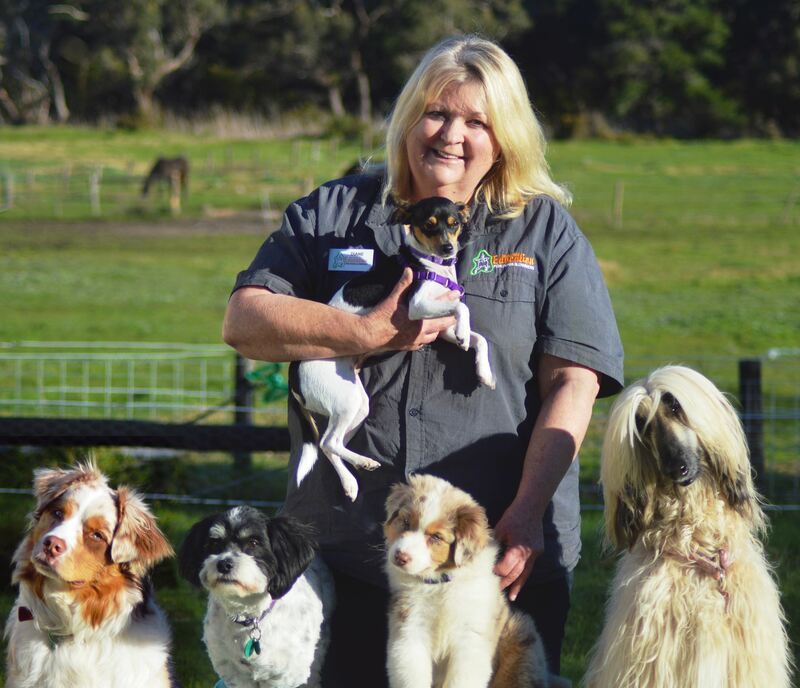 I work for Teachers Pets Dog Training, which my partner and I have been operating in Victoria since the beginning of 2006. The concept of my training dogs began as a child when, after watching a Lassie movie, I began to train my German Shepherd to go over jumps. My skills were improved many years later at the local dog club, where I both trained my dogs and worked as an instructor in Dog Agility, for 10 years. 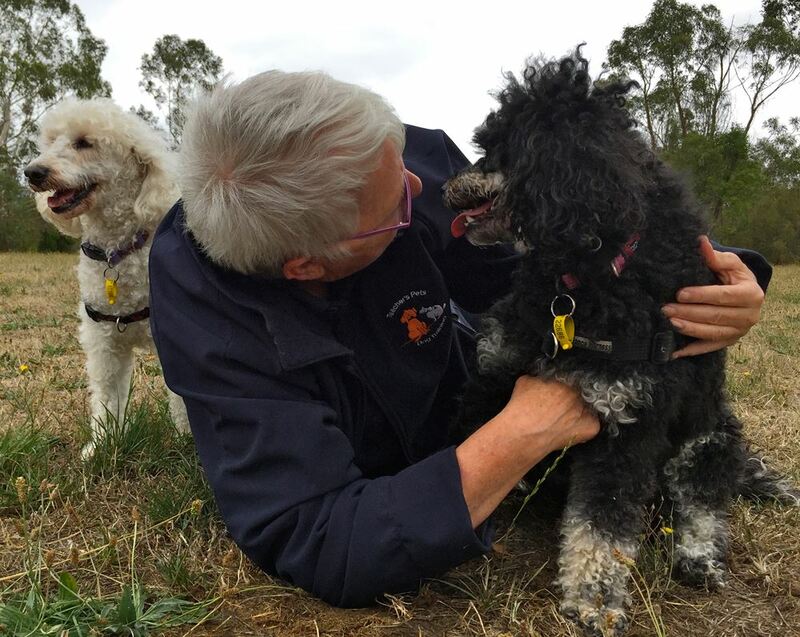 My Bachelor of Education taught me many learning and teaching principles but the Certificate IV in Companion Animal Services brought all my skills together in teaching animals. I am a cross over trainer who began learning to use corrections in training dogs but as I had a very sensitive dog, he soon taught me to find a better way.” No Pain, No Force, No Fear” Is the only way I ever wish to teach clients and their dogs. My best training tip. When asked by clients if I would use...(insert here) electric collar, etc. “ if you wouldn’t use it on your baby why would you use it on your dog? Training your dog, should be fun for both of you. Training should create a bond between you and your dog that is secured by trust and optimism. Let’s Go Fido is about showing you how, in a calm, clear and effective format that you the owner can understand and apply. The first 8 weeks that you have your pup are so important in shaping their confidence to cope with city life. The more we learn about dogs, the more paramount we understand these weeks are. Please enroll your pup into a force free puppy school with qualified up to date trainers as soon as possible and take the time off to positively socialise them to their future life. Those of us who adopt older dogs … please take the time to gently introduce them into your life and their city surroundings. Learn what they love to do and what they like less. Start creating a bond and start training using rewards …. build their confidence and trust in you. Then start training the skills both of you need.